The economist Tyler Cowen observed that few people when asked to describe their lives would answer ‘a mess.’ Instead they say their life was ‘a journey.’ They tended to use the metaphor of a novel. They see their life as a story. Life feels like a story because when we look back on our pasts, we have a beginning and an end and we can put it all in order. We can filter out the events that don’t fit, we can forget the stuff that’s not worth remembering. In a world of social media, this is a hard idea to shake. Not only does every platform and medium urge you to tell your story but it weaves it all into a narrative for you (Snapchat stories, Facebook’s Year in Review, etc). And because you have an audience—your followers, friends, fans and subscribers—there is always someone to perform it for. Think about what you put on Instagram, on Twitter, on a blog, on Facebook. These are great media but it’s clear they select for a very specific type of content. It’s got to be bite sized. It’s got to look good. It has to be spreadable. It has to compete with all the other content out there from professionals, from pretty girls, from snarky assholes. Oh, and it has to generate a certain number of public responses or you look like a loser. In a sense, these tools that were intended to help us share our realities ironically has turned into a sort of unpaid performance art. I know that you sense this too. That moment of hesitation before you post something. Is this good enough? That flash of guilty giddiness when you see something that you know other people would be impressed by when they see it. Yes! when you capture it perfectly. It might seem like we’re all connected with each other today but in fact, we’re as isolated as we’ve ever been. We don’t even experience our own experiences except through some artificial lens, let alone the experiences of others. It’s related to an important concept in science known as the “Publication Bias.” Discovered bafflingly recently (1960s), the Publication Bias refers to an interesting fact: people rarely publish papers about experiments that didn’t work. Who is going to put the time into writing it, and what journal is going to give space to something that doesn’t prove anything? This doesn’t seem like a big deal but it is. It means that almost every piece of scientific literature you’ll ever read is “positive.” When in reality, most experiments fail. Most of them don’t mean anything. So it paints a false picture, an unrepresentative one. It makes us think we know more than we do. You’ve seen this—friends who are going through a rough patch in a relationship but post loving photos of themselves with their partner, almost as if they’re willing it to be better. People going through financial difficulties apparently living it up on Instagram. Even in your own life, do you ever post when things aren’t going well? It’s the Publication Bias. It’s the Performance Bias. Nobody sees the article ideas that I couldn’t quite figure out. Nobody sees me when I am uncertain or unsure. I don’t write about the parts of my life I don’t feel qualified to talk about or I’m too embarrassed to reveal. And as a result, I leave a lot out. This is true for every public facing creative in the world. That’s just the filtering that comes from the selection process. It’s even deeper than that of course. 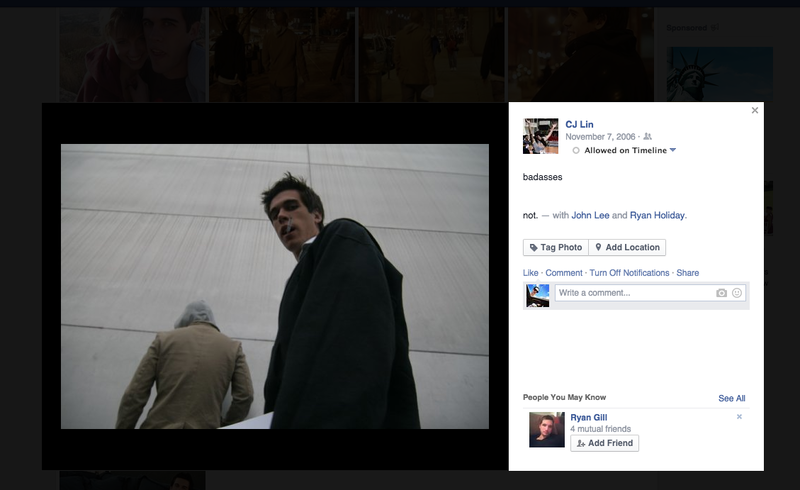 I like to show people the source photo that eventually became the cover of my first book. It makes me look a lot cooler than I actually am or ever will be (in real life it was a pen in my mouth and I was wearing a hoodie from Wal-Mart). The TV show they’re producing on the book will warp things further still. Increasingly, the real world is left on the cutting room floor. What is left is artifice and even deceit. Your Instagram filters can make an overcast day seem bright. A tweet can strip out nuance and claims certainty it doesn’t deserve. A Facebook post shares an article that no one actually bothered to read. These forces are acting on us. Separating us from our own actual experiences and separating us from the other people who consume them creates envy, inferiority and conflict. For one young, deeply depressed athlete, it meant misled parents and the loss of a great promising talent. It creates that eternal fear of missing out. It’s not lying. It’s that tools and media exploit our fantasies and what we wish to be true. Where does it end? Not in happiness, that’s for sure. One of the things I really like about Beme (where I’ve done some advising) is that the app makes so much of this impossible. It’s fun and real precisely because it subtly eliminates all the features that encourage us to fool others and ourselves. If you decide you want to film something, it’s posted automatically—you can’t stop the process once the recording has begun. You can’t edit your clips. You can’t even see what you’re filming as you’re filming it. In other words, it demotes you from your role as the cinematographer of your own life. It’s just a facilitator. 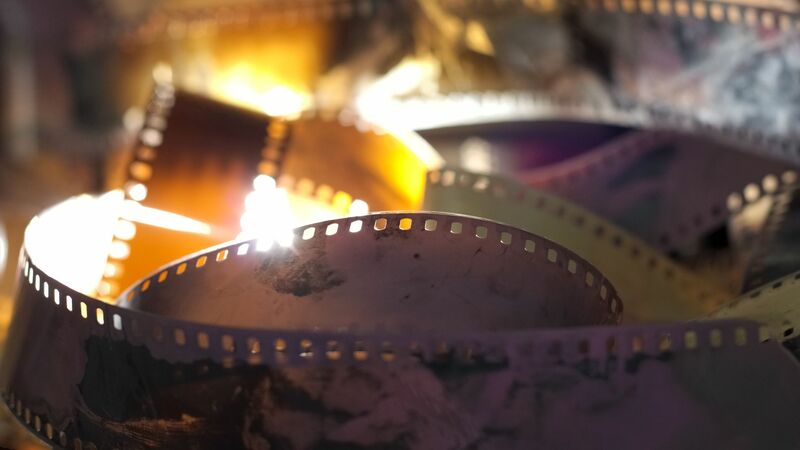 It helps you share what you experience—cutting clips together based on time and place, not your perceived narrative of events or the script you’d like to follow. It keeps the performance to a minimum. The name Beme—is a portmanteau of Be Me. Even the metrics in the app emphasize this (seen here). There is no follower count, just the number of people and the amount of time they have spent seeing things from your perspective. You actually get to be yourself and be other people and other people get to be you. Isn’t that what art is fundamentally about? Some critics have said that this doesn’t work. Because no one likes authenticity. Of course that’s ridiculous. The videos are riveting and the app is addicting. Like actual life. So in this sense, life is not like a novel. It’s not a movie. It’s a mess. Unfiltered by social media, life is real. It is what it is. Ta-Nehisi Coates is the single best writer on the subject of race in the United States. This is what it says on the cover of his new book, Between the World and Me. It’s actually a quote from The New York Observer (where I am an editor at large). I would take it a step further and say that he’s one of America’s best writers and journalists, period. I’m a big fan. I’m also disappointed in his new book. But before we get there, I suppose I should declare my various biases. First off, it was a book I have eagerly anticipated for some time–if only selfishly because this book has taken him away from the prodigious amounts of daily output that his fans have come to cherish over the years. The other bias is that my father was a police officer. First as a hate crimes detective and later the robbery division, and also as the head of Explosive Ordnance Disposal. Also I am white (though puzzlingly tan) and a writer myself. In other words, I bring some baggage to the table. But I also desperately wanted to love this book. Someone needs to articulate and detangle the pernicious myths and bad history that has long held our country back from dealing with, understanding and moving forward when it comes to the issue of race. It’s in literature that unique human experiences can be shared and communicated—and what it feels like to be black in America is a powerful and important reflection on this nation as a whole. In a world of television pundits and pageview hungry bloggers, it is rare to see someone as big picture and historical and thoughtful as Coates. It’s even rarer still to see them reach such a massive online audience without pandering, and without exploiting politics to get traffic. I am humbled at the way that Coates makes you think, makes you question your assumptions, and makes you see the inhumanity and disgrace of many of this country’s laws and politics. There are moments in this book that accomplish that. The result is that this book seems to rarely come out and say anything. Or at least, say directly what it means. The opening scene is Coates writing about an appearance on cable television where he discussed race, fear and safety with the host. But instead of coming out and saying that, he writes “Last Sunday the host of a popular news show asked me what it meant to lose my body. The host was broadcasting from Washington, D.C., and I was seated in a remote studio on the far side of Manhattan. There was a one word snaking into my ear and another dangling down my shirt. The satellite…” I’ll cut it there but it goes on like this for some time. My point is, what Coates is talking about is urgent and important. But it’s almost as if he doesn’t want to get to it. He can’t be direct. He has to refer to Howard University as “The Mecca” throughout the book, he has to use a million other euphemisms and overwrought phrases, but why? It doesn’t make his point clearer. On the contrary, if you’re not searching for it, you might miss it. In fact, it often feels like he missed it—or at least lost track of it. Elsewhere, I tried to imagine someone currently not convinced of Coates’ genius or the significance of his message. Sadly, I could not see them making it more than a few chapters before closing it and moving on to someone else. Someone less talented, less insightful, but at least more straightforward. No one would make that argument about his past writing, which is almost always cogent and clear and definitive. The response here will be that this book wasn’t written for me, or someone like me. The book was written as a letter to Coates’ son, so of course, some of this is to be expected. But certainly, no father would ever actually speak this way. Not without their kid rolling their eyes anyway. The irony is that there is a section in the book where Coates discusses what he learned from poetry. He writes “I was learning the craft of poetry, which is to say I was learning the craft of thinking. Poetry aims for economy of truth–loose and useless words must be discarded, and I found that these loose and useless words were not separate from loose and useless thoughts.” The reality is that this is a very short book that somehow manages to violate that dictum. It certainly waxes poetic at times, far too indulgently. A writer’s job, as Fitzgerald once said about ‘genius’, is “to put into effect what is in your mind.” An editor’s job is to help a writer sort through their own experience and lens of seeing so that the vision best reaches the audience. The audience’s job is take the step forward to the material and be prepared to receive and interact with it. Somewhere in the rush to publication (which was moved up in light of recent news events) these parties have not fully met. The book exists in some kind of thick bubble. Which is really unfortunate because as events have shown recently, America is its own impenetrable bubble. There’s that line from Kafka about how a book should be an axe that breaks the frozen sea within us. This could have been this book. Coates has been that writer for me, personally. His guided journey through the Civil War, through segregation and race relations and so many other topics, have been that for thousands of other people. Between the World and Me is a book with many gems in it but it forces the reader to search for him. And thus it fails to fully break through as one would hope. Lately it seems that whenever a technology startup is bought for billions , be it Instagram , Yammer , Viber , Waze , Tumblr , or Whatsapp , financial analysts predict another bubble in the making. We’ve had the 2008 recession, the tech bubble bursting in 2000, and now Robert Shiller, author of Irrational Exuberance , is worried about the next bubble. One answer is found in the great financial figures of the past who lived through similar bust and boom cycles, and see how they prospered through it all. Someone like John D. Rockefeller. Rockefeller had barely begun his career as a bookkeeper and investor in Cleveland, Ohio when the Panic of 1857 struck, a massive national financial crisis that originated in Ohio and hit Cleveland particularly hard. Just as he was finally getting the hang of things, here came the greatest market depression in history. Rockefeller put those insights to use. When he was 25 years old, a group of investors offered to invest around $500,000 at his discretion if he could find the right oil wells in which to deploy the money. Grateful for the opportunity, Rockefeller set out to tour the nearby oil fields. A few days later, he shocked his backers by returning to Cleveland empty-handed, not having spent or invested a dollar of the funds. The opportunity didn’t feel right to him at the time, no matter how excited the rest of the market was — so he refunded the money and stayed away from drilling. Like Rockefeller, we must practice this type of self-discipline with our own investments, whether its for a supposed “blue chip” IPO or our retirement fund. With assistance from our round-the-clock, say anything financial media, seemingly endless attractive opportunities abound — it is up to us to see through the madness of the markets. But Rockefeller wasn’t born this way. This was learned behavior. These strategies were developed in the market — in bad markets specifically. And Rockefeller got this lesson in discipline in that crisis of 1857. 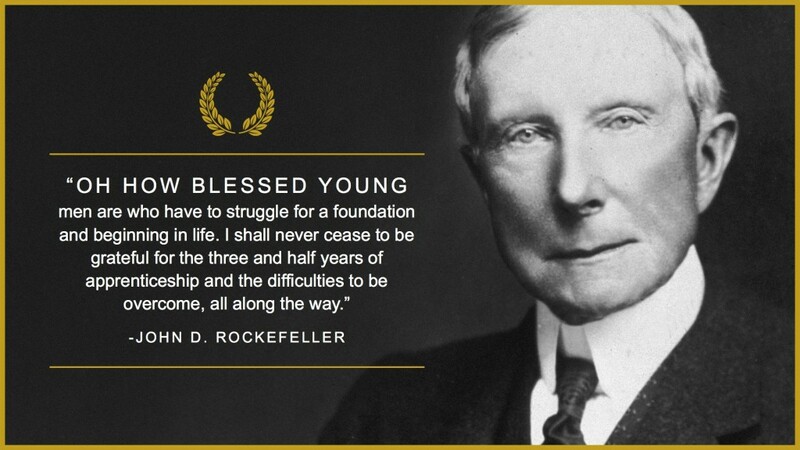 In what he called “the school of adversity and stress.” Understanding that the obstacle is an opportunity is a formula Rockefeller and other icons used to graduate from this school of hard knocks, using timeless philosophical principles forged over centuries. We can learn to perceive things differently, to cut through the illusions that others believe or fear. We can stop seeing the “problems” in front of us as problems. We can learn to see things simply as they are. Unhelpful perceptions can invade our minds — that sacred place of reason, action and will — and throw off our compass. We can see disaster rationally. Or rather, like Rockefeller, we can see opportunity in every disaster and transform that negative situation into an education, a skill set, or a fortune. Seen properly, everything that happens — be it an economic crash or a personal tragedy—is a chance to move forward. This post appeared originally on Medium.